I was delighted to spend three months at the Sainsbury Institute during the summer of 2014, an experience that helped me expand the parameters of my research project. 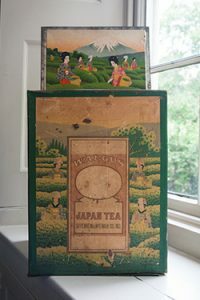 For the past few years, I have been researching Japan’s place in the history of the global tea trade. In the mid-nineteenth century, Japan became the first nation to challenge China’s long held monopoly over the world tea market. By the early Meiji period, tea had emerged as Japan’s second largest export (after silk), with primarily green tea shipped to the United States and Canada. In my project, I am examining equally the perspectives of the Japanese producers and the US consumers involved in the trade. Over the course of my research, I have collected an array of visual artifacts and located many fascinating objects related to tea consumption, too many to fit into the book I am writing. I am currently working out how to form the visual artifacts and objects into a museum exhibit with the goal of presenting new perspectives on US history through the lens of tea. Among the interesting details reflected in these images and objects is how farmers in the US Midwest, especially in the states of Minnesota, Wisconsin, and Illinois, became the prime consumers of Japanese green tea. The Institute staff as well as UK-based scholars and curators I met during my time in Norwich offered many suggestions for how to proceed with developing an exhibit, valuable guidance for a historian working for the first time on such a project. Moreover during my time at the Institute, I gained new insights researching sources related to the history of British tea consumption. 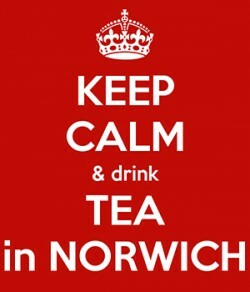 At the University of East Anglia, I was especially pleased to find an advertisement for a mid-nineteenth-century Norwich tea merchant listing a selection of green and black teas. In my Third Thursday lecture, I used the advertisement to help outline the social, political and economic factors that led to a divergence in Anglo-American consumption patterns in the late nineteenth century: Britons began to drink primarily black tea while their American cousins retained a taste for green tea well into the twentieth century. During the summer, my wife and I also took advantage of the opportunity to explore Norwich and the surrounding area. Simon Kaner generously showed us the Norfolk coast and treated us to a day at the Royal Norfolk Show, where we could learn about the area’s agriculture and farming (and I especially enjoyed seeing the fine horses). We also took in a public day at the Bishop’s Garden, enjoying the chance to see its splendid array of flora, including a rose bush grown from a cutting taken from Queen Victoria’s wedding bouquet in 1840. Within easy walk of the Institute we found a nice variety of restaurants. We regularly dined at Grosvenor’s Fish Bar whose affable American owner offers a nice variety of fish and chips. Perhaps best of all was Norwich’s fabulous daily market where we would have lunch at least once a week. Jason, the owner of a fruit and vegetable stand, epitomized the warmth and friendliness of Norwich—he quickly remembered us by name and often suggested fun places to visit in the area.